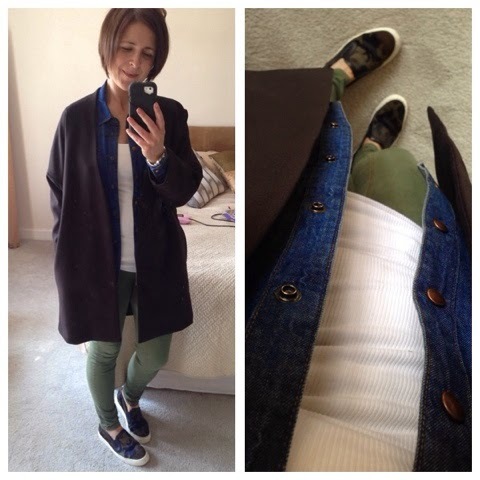 Every now and again denim jean fatigue hits and I find myself at the wardrobe wanting to wear something different. So for 3 days this week, I did just that and thought it might be useful to share these alternatives to blue or black denim jeans. 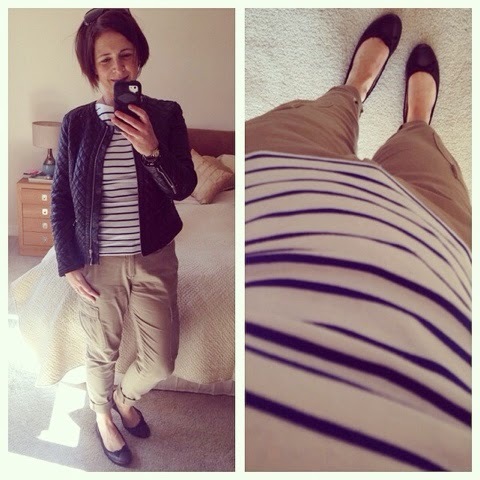 First up is Wednesday's outfit - I was at the gym in the morning and then went straight from there to my friend Kate for a deep tissue massage so it was all about the comfort in jersey harems and slip-on trainers. Just by the by, I've been having these massages about once every 6 weeks in Kate's treatment room over at Core Physio in east Belfast and they've been amazing for my back. Like most people, I hold a lot of tension in my upper back and neck and Kate really works that out during a treatment that is equally painful and pleasurable...if that makes sense! One Friday, I went for coloured jeans in the form of these khaki green skinnies and a denim shirt. I've so much love for this denim shirt. Best buy ever. Finishing with yesterday - combats, breton and a quilted jacket. We had a lovely morning sunning ourselves in Granny's garden (fully dressed...still on the cool side here!) then an afternoon at the Spring Fair up at Barnetts Demense. Brilliant free family fun day...the kids had a ball despite the queues and Belfast being Belfast, I met someone I knew during most of the waits so it wasn't so bad for me either. It's on again today (Sunday) from 1.30-5.30 with the entrance at Malone House. Out of those three, I still struggle a bit with the harems I'll confess. Love wearing them from a comfort point of view but sometimes look down and wonder if people think I'm in my jammies?! 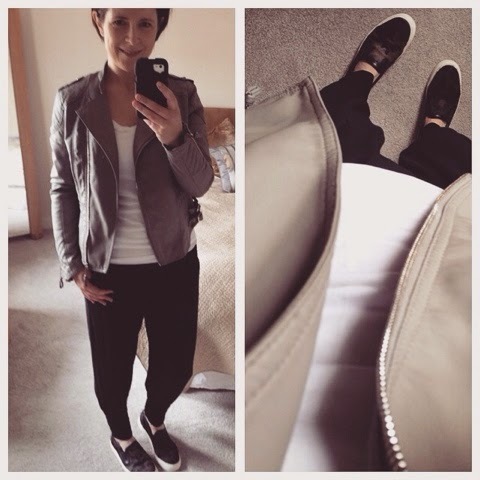 Jacket & shoe choice is key for them - the angular fit of the biker style jacket helps to give some structure to the outfit and had I worn a ballet flat, I'd have felt a bit more dressed-up. Would love to know your favourite alternatives...meanwhile, I'm back in denim today for the annual rugby festival. Not sure if the glamour of it all will make it to Instagram...watch this space. Love the green skinnies! You've reminded me to dig out my harems too! I am a bit of a denim addict, but I admit I do love my Hush harems. You're right though, they need a biker or a denim jacket to stop them slipping into pj territory! I love them with sandals in the summer, but my Ash Virgins are perfect with them when it's colder (a look blatantly stolen from Kat :-D).